Just before my senior year of high school, I sold my horse Chico. For years my entire life had revolved around the barn and horse shows. A combination of factors led to the decision (my trainer moved away and I didn't like the new one; the knowledge that I couldn't take Chico to college with me, etc.) but it was absolutely one of the saddest days of my life. Watching the horse trailer drive off with his white tail dangling out the back made my heart bleed. You might say a heart can't bleed, but I felt it. Mine did that day. Suddenly, I had all sorts of free time. And I desperately needed something to fill it, to keep busy. I had two friends - Ginger and Lisa - who ran cross country. I decided to give it a shot. Previously, the only running I had ever done was the obligatory mile each year during the Presidential Fitness Test (the majority of which I sadly failed...especially the chin hang deal). Cross country season started before school. I remember those early summer morning practices, the heat, the dew on the grass, the smell of sun and sweat. We ran on the track and through pastures and down roads. Mostly, I ran with the slackers. A group of females out running for fun, for chat, and for slurpees at the 7-11 down the road. Well, for slurpees that is until we got busted by our coach sitting at a picnic table beside the 7-11 while enjoying our Cola flavored slush and trading stories. Our coach, Mr. Dulin, was young and enthusiastic. He was just cute enough that most of the girls had a mild crush on him. He was creative and would often shake up our routines to make the practices more exciting. Once, he had practice in a very hilly neighborhood and he drove his little red sports car along-side, honking once to signal walk, twice to run, and three times to sprint. That was a tough workout. And so, as the summer ended I found myself becoming stronger. I didn't get so sore anymore. I was a little faster. And I could run a few miles without stopping - in spite of the slurpee habit I'd developed. With the end of summer and the start of fitness, it came time for the first race. Being 18 years ago, I'm not positive about location, but I believe it was in Rappahannock. What I mainly remember was the stories. The stories from my friends who had raced it before. Because they kept talking about The Hill. The whole bus ride there was full of warnings about The Hill. How to pace The Hill. Where it fell in the 3.1 mile race. I started to get a little bit nervous. In fact, I hadn't wanted my parents to come. What if I failed? What if I didn't finish or even worse - what if I finished LAST? I didn't want them to see that! By the time we got there, my stomach was a wreck of nerves. I remember taking immodium and praying I wouldn't have to make an embarrassing pit stop (because truly, what is worse than that for a high schooler?) Mr. Dulin gave us our pep talk and we stretched and did some warm up strides. And before I knew it, we were off! I don't remember much about the race. Certainly I wasn't fast. I never have been a very fast runner. But I have some perseverence I think. I got to the hill. All along the side teens were trudging their way up it at a walk. The hill towered above me massively, a dirt path rising up in the air. And I made up my mind then and there that I would.not.walk. I ran that hill. It wasn't fast. It wasn't fun. My lungs hurt. My calves ached. But I made it up. I finished the race without walking. I wasn't first and I wasn't last and that was just fine by me. 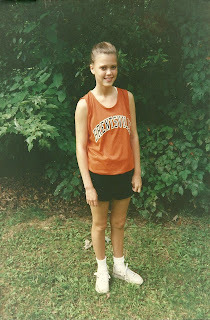 There would be many more cross country races that year, but the first is the one I remember most. Well, that and the slurpees and the cute boys on the bus rides! Copy the code under the button and paste it on your blog. After you write your blog on a memory of a sporting event, come back and add yourself to Mr. Linky. Then if there are others, check out their blogs and leave them a comment! And be sure to come back next week - topic is "A Crazy Weather Event"
OMGoodness, look how adorable you are in that picture!! What a huge accomplishment for you! It sounds like when you set your mind to something, you just go for it, which is awesome!! Aww, a tale of two Chicos! I lost mine to melanoma my freshman year of high school (I cried so hard, the red-haired stable hand at our barn cried, and even the vet who boarded her horse at the same barn got misty-eyed when she put him down). And I know you understand how much that hurt. Fortunately, I had other horses that I fell in love with during high school, but good ol' gray Chico, and your Chico, they were awesome, weren't they? I used that riding memory to write my "Memory Lane Friday" post. Anyway, I like how you threw yourself into running (and slurpee habit, LOL!). I enjoyed reading your memory. Thanks for sharing it!